Scott Glennie is the current highest (Dallas) draft pick to suit up for the Stars. It may not be next year, or maybe not even the year after that, but the Texas Stars have a chance to see a third overall pick on the Cedar Park ice in the near future. Last night's draft lottery saw the Dallas Stars on the receiving end of some friendly non-puck bounces. With the lottery, the Stars moved up from eighth to third. It will be their highest pick since the club moved to Dallas in 1993. Third overall picks don't generally spend a ton of time in the AHL before heading to the NHL, if the past is any prologue. Leon Draisaitl, Alex Galchenyuk and Jonathan Drouin, three of the last four #3 picks, played a combined 25 games for their AHL squads. For a bit of trivia, the Texas Stars have had a #3 pick suit up for them before, so it wouldn't be a first for that occurrence. It wasn't Dallas's pick, but defenseman Cam Barker was a third overall pick for Blackhawks in 2004 and played 23 games for Texas in 2012-13. The 2017 offseason is set to be the most tumultuous and interesting in years. Here's the calendar of the top events you need to be ready for. April 29 - Draft lottery. This decides who will draft first, a random selection weighted by how each team finished in the standings in 2016-17. Dallas has a 5.8% chance of winning the top draft pick. June 17 - Protected lists for the expansion draft are due from member clubs to the NHL. They should be released by the league shortly thereafter. June 20 - Las Vegas submits its final expansion draft selections. June 21 - NHL announces new roster for the Las Vegas Golden Knights. June 23-24 - NHL Entry Draft in Chicago. June 25 - Deadline for NHL teams to extended qualifying offers to restricted free agents. July 1 - NHL free agency begins. Early July - Dallas Stars development camp in Frisco. Usually held almost immediately after free agency, it is often the first time to see that year's draft prospects. Mid-September - Traverse City prospects tournament in Traverse City, Michigan. 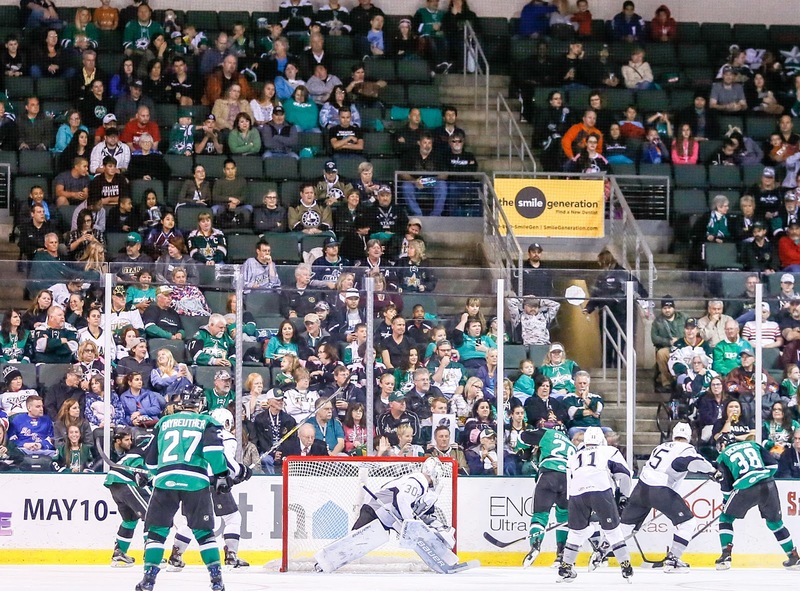 Late September - Dallas Stars training camp opens, likely in Cedar Park again. The Texas Stars season has come to a close and the next thing to worry about for many players is their professional contract status for next year. Here is the complete list of contract statuses for everyone who signed a standard player contract or ended the season with Texas. In their home finale, Texas put up a chippy effort but ultiamtely fell to the visting Rampage, closing the season three games below .500 at 34-37-1-4. With neither team having anything left to play for except for pride and contracts, it was a spirited contest. "It's not always easy but at the same time we're professional athletes and that's our job." said Brandon DeFazio. "We won two of three and showed we cared, and that's the biggest thing to take from it." It being the 14th in the season series between the two teams, it was surprising this was the first one to get so chippy. "I think we saw each other too much. I'm surprised it didn't happen more often. That was some old school hockey. Funny to see Petey flying down there." DeFazio, of course, is referring to the almost goalie fight following Texas's first goal of the night. Down 2-0 early, the Stars scored to cut the lead in half. Gemel Smith and goalie Spencer Martin had words after the tally and Justin Peters came flying down the ice as Smith and Martin traded jabs. Ultimately, there was no fight though. "I haven't seen a goalie fight here in three years and I was hoping to see one," said Coach Derek Laxdal. "I think the fans were too." The sellout crowd really got into it as Remi Elie and Dillon Heatherington scored with just 26 seconds separating the tallies. Some broken coverage gave the Stars a 4-3 deficit and was Colin Smith's second of the night. No one stepped up on the forward and he had a clean shot on net. Felix Girard would add another and Texas would look to clear the net for a chance at the 6-on-5 tally. Colin Smith scored his third goal of the night into the vacated net, but it was not an empty net goal as Peters was still on the ice. Coach Laxdal summarized, "It was a tough game. Full crowd and the guys wanted to play hard. It's hard to get up when the season's done. Tonight was a synopsis of our year. Power play hasn't been great and penalty kill has been really bad. It's been a tough year with injuries and call ups. It was a synopsis of our year and showed a lot of the places we have to improve next year." The Stars will clean out their lockers on Monday as disperse across the country and world for the summer. Caleb Herbert is the only Texas Star remaining who will head to the Idaho Steelheads for their playoff run. For just the second time in eight years, the Texas Stars will end their season without playoffs on the horizon. It's an extremely strong record and one that many teams, including the San Antonio Rampage, for one, should be quite jealous of. Last night's game saw Texas continue to play a young lineup. Even with Justin Dowling available, the Stars opted for Caamano, Sturos and other young guns to finish the season. The only question mark is who do you start in net. I could make an argument for any of the three netminders currently on the roster. Perhaps Lagace gets one last chance to send the season off right. I think it's extremely unlikely though. Perhaps Desrosiers gets the call since he had such a good showing last night. And finally, Justin Peters may get the start as Texas looks to win out but doesn't know if Phil has enough in the tank to play two nights in a row. It was a huge night for goalie Philippe Desrosiers. In his first game back in the AHL since November 16th, he pitched a perfect game, stopping all 29 shots against him. It was Desrosiers's first career shutout. The lone goal in the game came off the stick of Denis Gurianov, a swooping right-to-left move that left Spencer Martin down and out before Gurianov even took the shot. Desrosiers's path back to the AHL may have begun tonight. He was sent to Idaho in November and was reassigned to Norfolk earlier this year. Usually, assignment to another minor league club means the end of the road. However, Desrosiers still has another year on his contract, so that seemed unlikely. 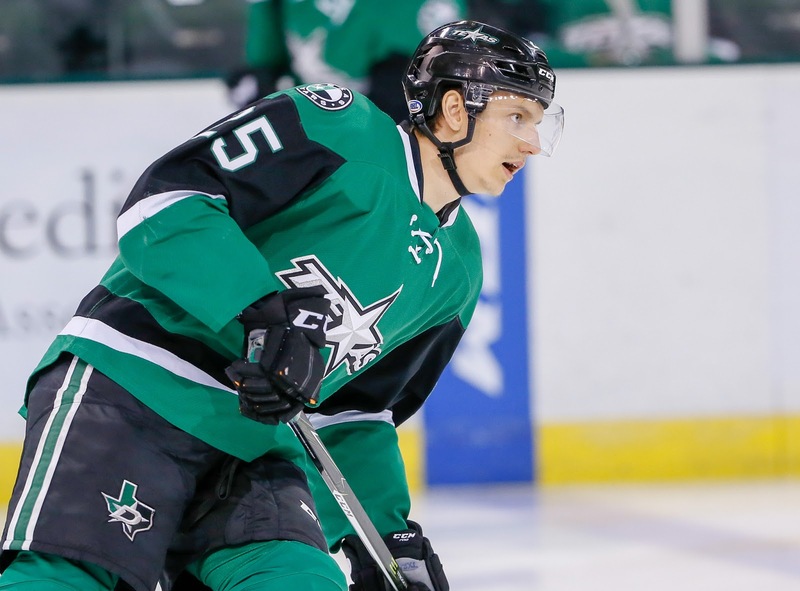 With Texas eliminated from the playoffs early this year, the Stars gave Desrosiers a chance against the Rampage in the final three games and it paid off. With any luck, this is the game that will serve as a pivot in his career trajectory. Texas ends the season tomorrow against San Antonio at home. One down, two to go. Texas hits the road for their final trip of the season. It's a simple one down I-35 for their 13th matchup of the year against the Rampage. Texas is 8-3-0-1 in the season series and somehow 38-13-4-7 over the past five years. 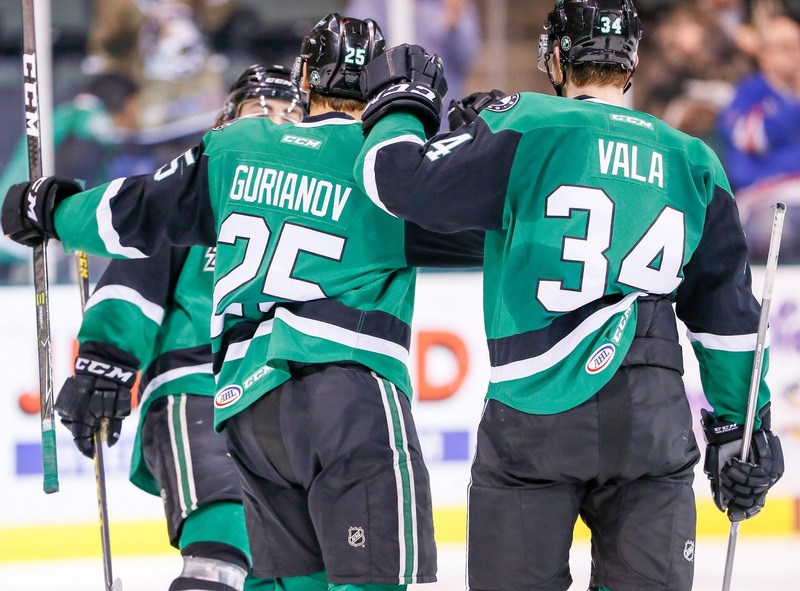 The Stars are on a bit of a streak, having garnered points from San Antonio going back six games to December. Both teams will again focus on finishing the season out right. If I were to pick one game for the Rampage to win in the series, it would be this one tonight. It's the home finale for the club and they'll likely pack the stands. The Stars will add Justin Dowling back to their lineup, which should allow them to assign Caleb Herbert to the Idaho Steelheads for their playoff run, starting tonight in Colorado. Justin Dowling has been assigned to the Texas Stars this afternoon for the final two games of the AHL season. He was on the Dallas roster when the season ended, but he was injured and could not be sent down. Now healthy, he can play in those last two games for Texas. The Texas Stars, American Hockey League affiliate of the NHL’s Dallas Stars, announced Thursday forward Justin Dowling has been assigned to the team from Dallas. Dowling, 26, has recorded two assists (0-2=2) in nine games for Dallas this season. He has also registered 28 points (8-20=28) in 49 AHL contests with Texas. The 5-foot-10, 185-pound native of Cochrane, Alta. went undrafted and was originally signed by Dallas as a free agent. 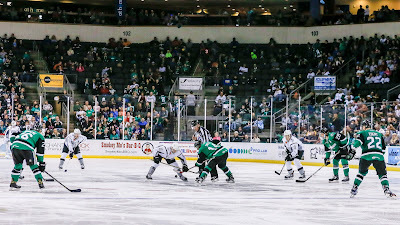 As the season draws to a close with three final games, the Texas Stars concentrated on finishing their schedule the right way against San Antonio. They accomplished that mission tonight with a close 4-3 victory over the visiting Rampage. "Both teams want to finish the season the right way," said head coach Derek Laxdal. "We want to get close to finishing at .500. If we can finish with 2-3 wins, it makes it a little bit better." The Stars and Rampage alike put a number of young players into the lineup for the contest, and they made impacts. Ondrej Vala, Nick Caamano and Reid Sturos all laced them up for Texas, putting another useful notch in their belt on the way to their pro career ahead. "It's all about experience for these kids. This is a chance for the kids to develop and get them a step in that process. Vala is 18 years old, and he looked like a veteran defenseman out there. Caamano didn't look out of place on the PP and PK. When you get these chances, it really helps your development." San Antonio did get the first goal of the contest, but the Stars battled back with two of their own. Gemel Smith rainbowed a goal over Joe Cannata to end the first period, and Matt Mangene scored on the power play to take the lead in the second. Smith was one of the five players sent down from Dallas playing in tonight's game. He and Denis Gurianov both scored in the contest. Jason Dickinson, who was one of those five, expanded, "[Playing in the NHL] brings a little bit more confidence. The little things they do. The game is so tight up there and there's very little space to make plays. That's the big thing to translate [to the AHL] is to make those little area plays they make up there." The Rampage would even the score at two on a power play of their own. It was a 5-on-3 tally that Texas almost made it through. The tie didn't last long. A deft tip off the stick of Cole Ully found twine for the 3-2 Texas lead. Denis Gurianov scored on a rebound in the third period to extend the lead to two. It was his 11th of the season. Laxdal noted particularly on their play, "It shows the next wave of kids getting ready for Dallas. They played well and did a great job generating the goal. It's good to have them back in the lineup." Reid Petryk would score to make it a one-goal game late. The Stars held tight with players like Caamano on the penalty kill. A late game PK featured Caamano, Gavin Bayreuther, Denis Gurianov and Mangene. It was a youth infusion. Justin Peters finished the contest with 24 saves on 27 shots. These two clubs face off twice more to end the season. Friday in San Antonio is the penultimate matchup. Texas will end the season with a three-game set against San Antonio, starting tonight in Cedar Park. If Texas had been a little better this season, this could have been a very significant series for the club to improve their playoff positioning. Instead, it will probably more resemble a preseason matchup. With both teams out of the playoffs, Texas is going to lean heavily on some of the kids in the lineup, such as Bayreuther, Caamano and even Vala, similar to what you would see in the preseason. With the recall of Philippe Desrosiers from Norfolk, it is even possible the once-castoff goaltender could get a start in the final three games here. While Texas can't slip to last place, they can move into 7th if they don't win a few here. So, for pride, they'll look to hold off Tucson in the 7 spot and retain 6th. Regardless of outcome, the team cannot get back to .500 hockey on the season at four back with only three left to play. A few roster moves happened today as the Dallas Stars cleaned out their lockers and did exit interviews. First, Julius Honka will not be joining the Texas Stars this week despite his assignment to the AHL yesterday. Instead, he will head to Europe to join Finland's World Championship training camp. The tournament begins next month and will be played in Germany and France. Honka is not a lock to be on the team yet. Additionally, Texas assigned Mike McMurtry to Idaho today. He will spend the next few days getting prepped for the Steelheads' playoff battle to begin on Friday against Colorado. With more PTOs than NHL-contracted players in the lineup, Texas fell to Charlotte this afternoon by a 3-1 final. Gavin Bayreuther had the only goal of the game for the Stars. Travis Morin missed the game due to injury, putting Cole Ully and Matej Stransky in the lineup as the only forwards with an NHL contract. The Stars lone goal of the was assisted by some of their PTO players, Angelo Miceli and Allan McPherson. Justin Peters stopped 27 of 29 shots against. The Stars return home to play San Antonio three times to end the season. In news first reported on Sean Shapiro's Wrong Side of the Red Line, Texas Stars head coach Derek Laxdal has already been renewed for next season. While the deal is not a new development, this is the first public disclosure of the deal. While many have maligned the former Oil Kings and Steelheads coach during his time at Texas, last night's game in the NHL was a perfect example of why the Dallas Stars are renewing his contract. 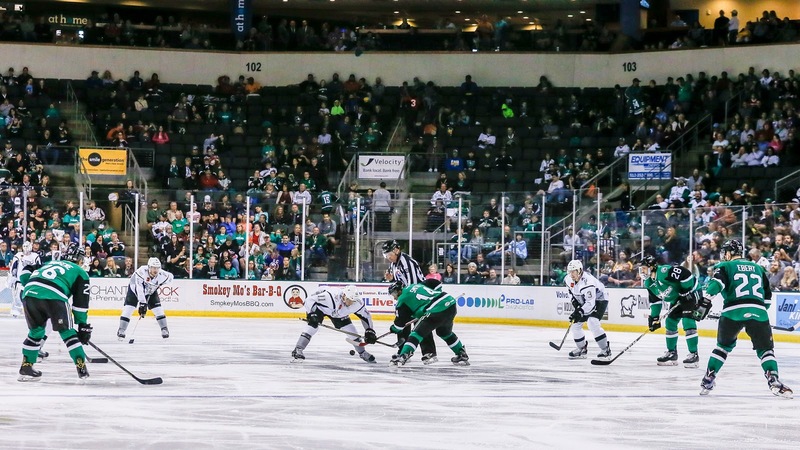 There were only four skaters in the lineup who had never played with the Texas Stars. Further, with players like Gemel Smith and Denis Gurianov in the lineup, Laxdal's stamp on the team was clear. Neither player was expected to play a single NHL game at the start of the season. Gurianov got into one and Gemel Smith finished with 17. More to come on this story this week. UPDATE: Dallas has assigned six of the seven recalls back to Texas, but none of them will be available for today's game. Texas added three players from ECHL Greenville for the day: forwards Allan McPherson, Angelo Miceli and defenseman Joe Houk. Charlotte just blasted Texas last night. But here's the problem, Texas isn't getting any more players and Charlotte is going to be even hungrier than last night. They won but so did the Cleveland Monsters. The two clubs are locked up in the race for the last playoff spot in the Central Division. The Checkers have a game in hand and certainly aren't interested in letting anything slip away at this point. While Dallas is done with their season, no one left DFW last night en route for Charlotte, North Carolina, for a 1 PM ET game. Expect to see Alderson, Vala, Caamano and others in the lineup once again. In the final game of the 2016-17 season for the NHL's Dallas Stars, the lineup was nearly unrecognizable compared to the first. Dotted across the roster were Texas Stars recalls necessitated by injury across a long, difficult season. In all, the final game featured six players who were playing in the AHL as recently as last month. Justin Dowling was also in the press box with an injury sustained in Thursday's game. Dallas head coach Lindy Ruff said the development of the players from Texas and the younger players was the thing that was most impressive this season. The player everyone had their eye on was Denis Gurianov. The 2016 first round pick was playing his first NHL game after a solid rookie season in Cedar Park. No one expected to see the Russian in Dallas this year, but the depth of the system was challenged greatly and, in the final game with nothing to play for but pride, why not? Gurianov finished the game with 13:06 of ice time. It was the lowest total on the team, but it was noticeable when he was on the ice. He started the game, perhaps to calm the nerves a bit, and had a good chance in the first period. "For the first game, I thought he got a really good feel for the speed of the game," said Ruff. "Some of those plays where he got wound up down the wing, he would have been in [those plays] in the American League maybe. But I think he realizes everyone is mobile and fast here, and he just has to get stronger and quicker with the hands. Early on he was a little nervous to make a play, but it was still a good showing." Gurianov was happy to get the win and get a chance to play at this level. He said after the game he was nervous coming in but calmed down after getting to handle the puck right out of the gate. 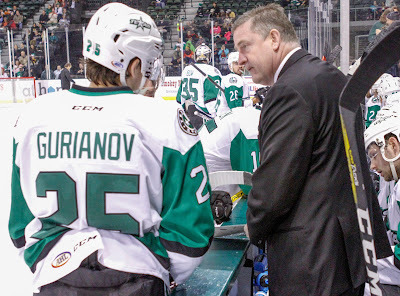 Gurianov will likely rejoin the Texas Stars for their final three game of the season back in the Lone Star State. The first period really told the entire story of the night for the Texas Stars. Charlotte outshot the Stars 16-2 in the frame walked to the locker room leading 4-0 after twenty. With only two NHL-contracted players in the lineup and a smattering of amateur and pro tryouts filling the gaps, the 9-3 final was a tough but predictable outcome against a team that is fighting to make the playoffs against Cleveland. Matej Stransky was the lone bright spot for the Stars, scoring two goals despite initial indications that he would be out of the lineup after taking a puck to the face in Wednesday's game. Ethan Werek had the Stars' only other goal. Travis Morin left the game early and did not return. Texas is next in action tomorrow at noon Central time, a quick turnaround for both teams. It will be Charlotte's home finale. 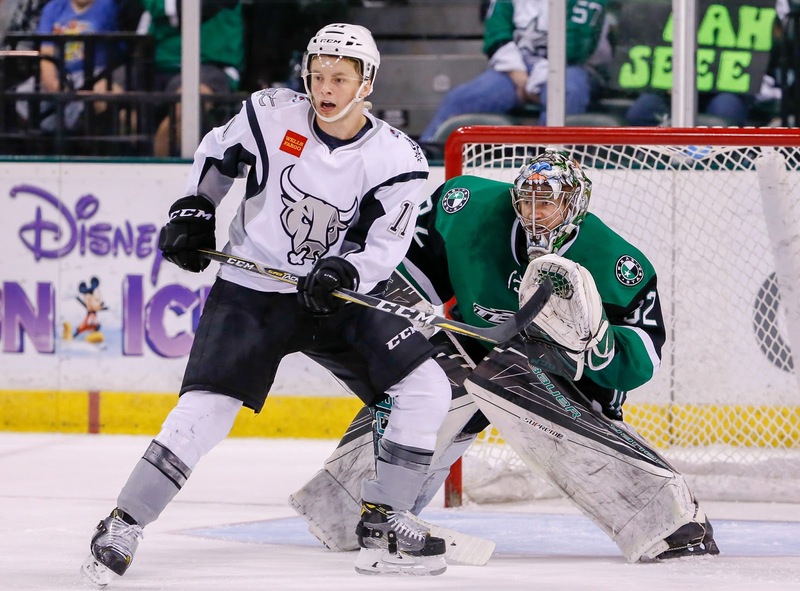 UPDATE: Texas has added Brandon Alderson on a PTO to supplement their forward corps. In a bizarre scheduling oddity, the Stars and Checkers opened the season against each other and now don't play again until today, the second to last weekend of the season. In between, the two teams have gone in very different directions. Charlotte is in a heck of a playoff fight with defending champs Cleveland while Texas is looking to play spoiler for the Checkers. The Stars have exactly 19 skaters available for tonight's game and the balance of forwards versus defenseman is not great. 10 of those 19 are defensemen, including the recently assigned Ondrej Vala. The rookie 18-year old was assigned last night from Dallas and could play in a few games. He'll head back to juniors next season though. Excepting Matt Mangene, Texas has to choose two more defensemen to play forward in tonight's game, barring a late PTO from one of the surrounding ECHL clubs that isn't making the playoffs (Norfolk) or doesn't have to worry about the standings this weekend (Greenville). All of this will be moot after tomorrow as Dallas is likely to send down enough forwards to make the team whole again for the final three games against San Antonio. So who do you pick? If I were to guess, I'd say you put together a line with two defensemen on the wing and a center like Austin Fyten in the middle. Probably Dustin Stevenson and Ludwig Bystrom, if I had to bet. Needing two forwards for their final game, Dallas has recalled Denis Gurianov and Mark McNeill for Saturday's finale. McNeill has played one NHL game in his career with Chicago. This is his first call up with Dallas after being acquired via trade at the deadline. Gurianov is an interesting call up. Being a first-round pick, he was certainly going to get ample chances to play in the NHL sooner rather than later, but I'm not sure anyone anticipated it being this season. However, he has done well in North America, and this is a decent reward for that work. As long as he continues working at the steady pace he set in the AHL this season when next season comes around, he'll be back in Dallas soon enough. Dallas Stars General Manager Jim Nill announced today that the club has recalled forwards Mark McNeill and Denis Gurianov from the Texas Stars, Dallas' top development affiliate in the American Hockey League (AHL). McNeill, 24, has registered 37 points (9-28=37) in 76 total AHL games in 2016-17. The forward began the season with Rockford where he posted 28 points (6-22=28) in 58 contests. He has also recorded nine points (3-6=9) in 18 games with Texas. The 6-foot-2, 212-pound native of Edmonton, Alta. was originally selected by Chicago in the first round (18th overall) of the 2011 NHL Draft and was acquired by Dallas via trade on Feb. 28, 2017 in exchange for defenseman Johnny Oduya. Gurianov, 20, has earned 25 points (10-15=25) in 54 games with Texas in his first season of North American hockey. His 25 points lead all Stars rookies this season, while he also paces team rookies and ranks seventh among all Stars skaters with 10 goals in 2016-17. The 6-foot-3, 200-pound native of Togliatti, Russia was originally selected by Dallas in the first round (12th overall) of the 2015 NHL Draft. Well, the Texas Stars have more than one numbers issue at the moment. The obvious one is the fact that they will likely be eliminated from the playoffs officially tonight. The second is that they have just 19 skaters available as they hit the weekend road trip, and Dallas just had two injuries in their game last night. 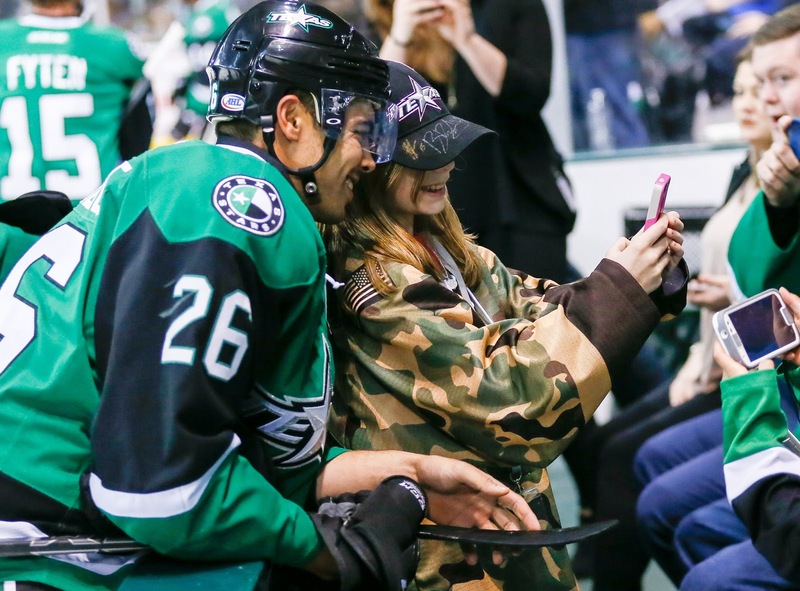 The call up list was already long with Remi Elie, Jason Dickinson, Julius Honka, Gemel Smith and Justin Dowling all in Dallas. Dowling and Brett Ritchie were injured last night and Dallas needs two more forwards for one game. Here's the complication: There are only four available Dallas-contracted forwards in Texas right now. With Matej Stransky injured, Travis Morin, Mark McNeill, Cole Ully and rookie Denis Gurianov are the only players available. Morin is probably the most likely and perhaps McNeill gets the call as well. It makes Texas pretty thin up the middle, if so. 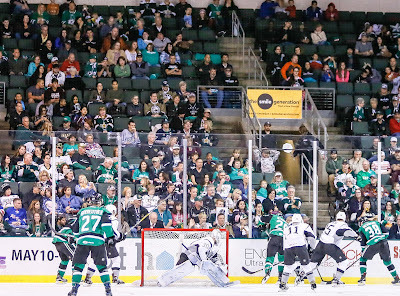 Texas has even more to worry about with balancing their ECHL affiliate. There isn't anyone on AHL contract left in Idaho, and the playoffs are likely to start for the Steelheads as early as Tuesday. If they sign someone like Will Merchant, they may not return him to Idaho until after the playoffs start. My inkling is that it would be better to sign a PTO with some players who are not going to be making the playoffs from the ECHL to fill the gaps. Texas is travelling to Charlotte today. Texas has had so much success when scoring first this season that it's no wonder it's been a focus of the club as the season has drawn to a close. Tonight, looking to play a spoiler against the Bakersfield Condors, Texas opened up a 3-0 lead in the first en route to a 4-3 victory over the visitors. "It's always nice to get the first goal and to get the lead like that," said Cole Ully, whose goal in the second period was the ultimate game-winner. "It felt good to hold onto the lead." Bakersfield turned up the hear in the second and third periods, drawing within one goal with half a period remaining. "We just knew we had to stay calm. We switched to a more defensive forecheck and held them off. It felt good after a couple games giving up leads." Coach Laxdal agreed, "We had really good energy to start the game off and through the whole game." Starting the game, at least on the official scoresheet, was Nicholas Caamano. The 18-year old amateur tryout out of junior played in his first pro game and collected his first pro point on Austin Fyten's first period tally. "It was a great experience. One of the funnest nights I've ever had playing the game," said Caamano postgame. "It was great to get the first one under my belt. Fyten made a great shot there, so I was lucky to get the point." Laxdal added, "That's why I started him, to getthe butterflies out of him. He, Fyten and Reid [Sturos] did a great job getting pucks in deep and playing a grinding game. We haven't had that this year and he probably had 12-13 minutes by the end of the game." Before Caamano's point, Ethan Werek and Caleb Herbert scored within 14 second of each other to put the Condors on their heels. The Fyten goal ended the night for Nick Ellis, who finished with 4 saves on 7 shots. Jonas Gustavsson relieved him and ended up taking the loss, allowing the Ully goal in the second. Bakersfield charged back in the second half of the game, closing a three goal gap to just one. Texas started taking penalties late but locked it down to prevent the tie. Texas will be without Matej Stransky as they hit the road this weekend. The Stars' leading goal scorer got hit in the mouth with either a stick or puck right in front of the Bako net, sending him off for repairs. He seemed a little dazed as he headed to the bench as well. The Stars hit the road with just 19 skaters available to face Charlotte on Saturday and Sunday. Be sure to grab a program as you walk in tonight, because you may not recognize these Texas Stars without one. Several subtractions and additions since the last home game have filled the team with a lot of raw, young talent. The first will be Reid Sturos, who has already played a few games with Texas, has yet to make his home debut. The forward out of Michigan Tech collected an assist on Saturday and wears #37. Nicholas Caamano will also be making his pro debut. He's an 18 year old who will go back to the Flint for next season but has a chance to get a very 'from the firehose' taste of professional hockey tonight against Bakersfield. Finally, Chris Martenet, the 6'7" defenseman out of Ottawa (most recently), could be a lineup option as well. The Stars will be without Dowling, Elie, Dickinson, Honka and Smith. Austin Fyten is still questionable with a head injury from that puck to the face two weekends ago. If you want to get down to the numbers of the game tonight, this could be the one that officially eliminates the Stars. If Bakersfield, who is in the four spot, beats Texas, it's over. With 6 games remaining for everyone still in the playoff hunt, the magic number line is 24. Texas is at 23 tonight and a loss would drop the line to 22 while the Stars' magic number would stay at 23. Two more ATOs joined the Texas Stars today, one confirmed and one just reported by the player's college team. Earlier today, Western Michigan reported that captain Sheldon Dries, a 5'9, 186 pound forward, had been signed by the Texas Stars on an ATO. Dries was the captain of the Broncos for three years; it's quite an accomplishment for a sophomore to be named captain. The signing reinforces the Stars' commitment to leadership type players. The team has not yet confirmed this signing. 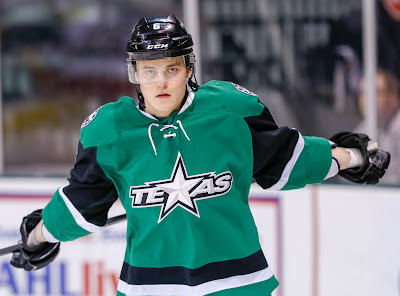 Secondly, Texas signed Dallas Stars draft pick Chris Martenet, a defenseman out of the OHL. He won a championship in the OHL with London last season and was traded to Ottawa. He signed an ELC with Dallas at the end of last season. He will likely play in Texas or Idaho next season. For what it's worth, Martenet is now the third 6'7 defenseman in the Stars system (Miro Karjalainen and Jamie Oleksiak being the others). Finally, Dallas recalled Justin Dowling earlier today. 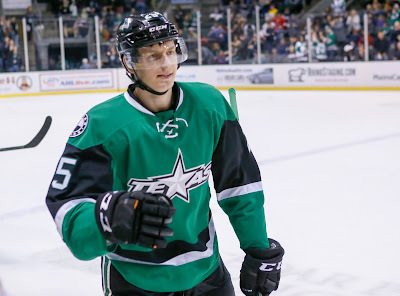 The Texas Stars, American Hockey League affiliate of the NHL’s Dallas Stars, announced Tuesday defenseman Chris Martenet has been assigned to the club after finishing his junior season in the Ontario Hockey League. Martenet (mar-teh-NEHT), 20, comes to Cedar Park after a three-year stint in the OHL with the London Knights and Ottawa 67’s. 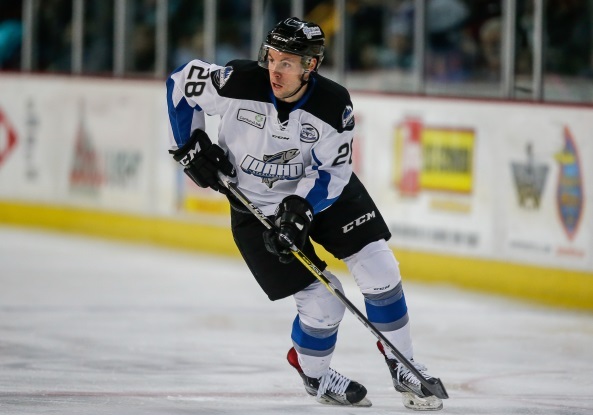 The 6-foot-7, 215-pound blueliner also spent the 2013-14 season with the USHL’s Indiana Ice. The St. Louis, Mo. native won the Memorial Cup with London in 2016 as champions of Canada’s major-junior hockey league system. He tallied 16 points (5-11=16) in 55 games this season split between London and Ottawa. On May 18, 2016, he signed a three-year, entry-level contract with Dallas. Martenet was a fourth-round pick of Dallas (103rd overall) in the 2015 NHL Draft. The Dallas Stars' 2016 fifth-round pick, Nicholas Caamano, has been added on an ATO this afternoon. Caamano just finished his season with the OHL's Flint Firebirds. There, the forward was nearly a point per game player with 64 points in 67 games. With two additional players in the lineup since Sunday (with the Dowling assignment earlier), Texas also announced the release of Will Merchant. Just a quick note this afternoon that Justin Dowling has been reassigned to the Texas Stars. He played in both Dallas games this weekend, notching two shots among just over 25 minutes of ice time. Less than 24 hours after a 5-2 win, the Stars fell to the same Milwaukee Admirals by a 7-2 score to end their season series against the club. Yesterday, Milwaukee opened the scoring with a pair and then Texas rattled off five unanswered for the win. The script was flipped entirely today as Texas notched a pair early off the sticks of Mark McNeill and Matej Stransky then gave up seven. Vladislav Kamenev, Pontus Aberg and Justin Florek all had a pair of goals for the Ads. Aberg and Kamenev had three point nights, each adding an assist on Kirkland's goal. Alexandre Carrier had three assists as well. Maxime Lagace got the start for the Stars, his first since February 24th. Texas finished their only 3-in-3 of the year with two losses, bringing their record for the season to 31-34-1-4. Texas is on the brink of playoff elimination this week and could see their hopes dashed on Wednesday against Bakersfield. After the first period in tonight's game, it was all Milwaukee. Up 2-0, it looked like the Admirals were going to roll to an easy victory at home against the Texas Stars. The visitors did not agree and popped off five unanswered goals to win 5-2. Denis Gurianov got things started with a franchise-record setting 14th team shorthanded goal of the season. Gurianov, who has been getting a chance on the penalty kill recently, showed what he can do in open ice. Receiving a pass from Darren Dietz, Gurianov started the comeback at 13:49 of the second. Ninety second later, Brand DeFazio notched his 21st of the year to tie things. Nick Ebert came in at just the right time, sliding down the right-wing side to beat Marek Mazanec for the 3-2 lead. The Stars would earn two more into the empty net in the final minutes of the game. Mark McNeill, Brandon DeFazio and Andrew Bodnarchuk were all plus-4 in the game. Justin Peters stopped 27 of 29 shots against him. These two teams play again tomorrow afternoon to end the Stars' only 3-in-3 of the year. 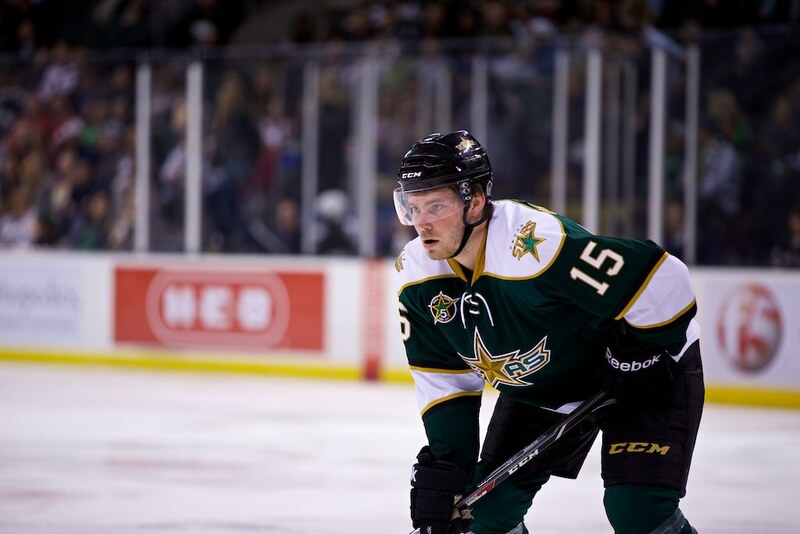 The Texas Stars announced today that they have signed forward Will Merchant to a PTO. The rookie forward was one of the last cuts from training camp and has been in the front of the line for a PTO for a while out of Idaho. He's made his bones in the ECHL on the power play. He may not make it to Milwaukee in time for tonight's game, however. Texas may have to roll 8 D again to get 18 skaters. 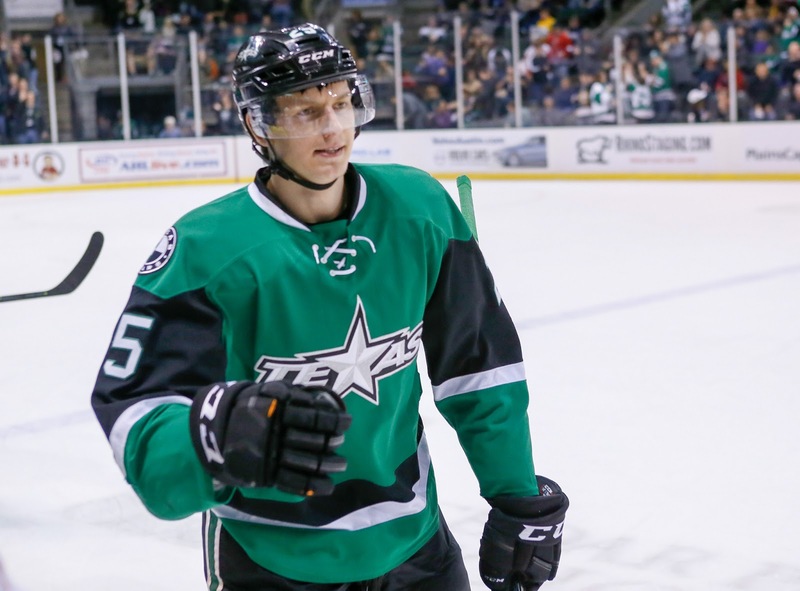 The Texas Stars, American Hockey League affiliate of the NHL’s Dallas Stars, announced Friday the team has signed forward Will Merchant to a professional tryout agreement. Merchant, 23, began the season in training camp with Texas before being returned to the Idaho Steelheads, the ECHL affiliate of the Stars. The 6-foot-1, 190-pound forward has tallied 48 points (21-27=48) in 66 games this season with Idaho. The Eagan, Minn. native is currently in his first professional season after finishing up a four-year career at the University of Maine. The Stars visit the Milwaukee Admirals at 6 p.m. CST tonight. Once again, I'm welcoming in Daniel Lavender from Admirals Roundtable to assist with today's preview. You should really follow him on Twitter. HDH: So congrats on the playoffs, first of all. We're hoping to have a similar recovery here... next year. Anyways, what's this team's DNA right now? DL: Well, we haven't been confirmed of any playoff berth just yet -but- with results tipping the right way it can get locked up this weekend with some wins and outside help. I'd say that when we first met back in December it was around the time the Admirals were slowly starting to succumb to the injury woes that the Nashville Predators were dealing with topside. That trickled into January and the resurgence of late has been building ever since February. The talk of the team has been having a "defense-first" mentality and to make life hard for opponents on home ice. It has been a grind getting everything together but the veteran leadership, youngsters, and new inclusions along the way have finally started to solidify into something really positive at a great time in the season when things need to start clicking. HDH: I mean, Mike Ribeiro... how's that going? He's a former Dallas Star, so it's of particular interest over here. DL: Boy, I had my concerns. His reputation kind of precedes him at this point - which is sad. Especially because my fears of him potentially joining the Milwaukee Admirals being a negative were instantly gone once I saw his face light up taking to the UW-Milwaukee Panther Arena for his first official practice with the team. He has been nothing but the pro, leader, and mentor that you would hope for him to be since joining. His work alongside the likes of Frédérick Gaudreau and Anthony Richard hasn't just been great now but those two are likely benefiting massively as they play and learn alongside someone of his talent level. HDH: How has Derek Army been this season? He's a former Texas Star by a few games. DL: Derek Army might be one of the best personalities that I've come across in my five-seasons around the Admirals. I don't think that guy ever has a bad day and could offer up at minimum four of the best places to get cookies where he is playing even if he did have a bad day. The guy works really hard on the ice and also gets into the dirty areas right at the net. It's helped him produce offensively from a fourth line PTO role. 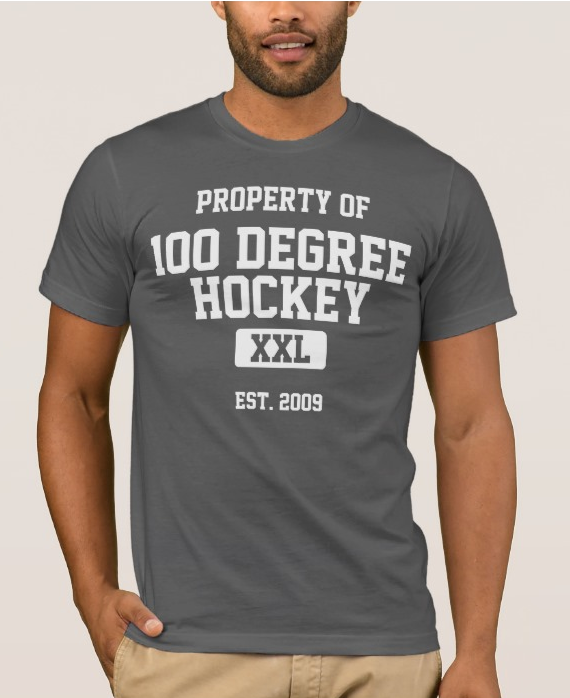 You never entirely know what you get when guys get that chance on loan out of the ECHL. You'd hope most treat it like an audition for bigger and better things. I feel as if Army has. I'd hope he sticks around this team past the 2016-17 season. HDH: Is this team ready for the playoffs or are there still some gaps to fill in before that point? DL: There are still a few sore spots. Certainly the last month or so has seen this team really start clamping down the "defense-first" mentality but they still take an awful lot of penalties. Once the playoffs start up, which teams at this stage of the season should be treating all games like they already have, penalties can't simply be handed out and to lean so firmly on penalty killing and goaltending. When the Admirals are at their best is typically keeping the game at five-on-five while rolling out all of their lines. If they can avoid the penalty box they have all the makings of a ream that could make a serious run. The then named Lake Erie Monsters weren't the greatest of teams on record when they entered the 2016 AHL Calder Cup Playoffs. They were the hottest team. The Admirals are starting to get hot at the right time. DL: God, I hope not. Whether it be in baseball or hockey I've never understood unwritten rules. In any professional sport I also don't quite get idea of not running the score up. Just because one side gives up doesn't mean the game is over, does it? That 9-1 win for the Admirals last time in Texas was a perfect storm for a scoreline such as that to happen. The Admirals couldn't miss and the Stars couldn't seem to care less. I would be more mad at my own team than I would the opposition ripping off that many goals. If the Stars spent over three months annoyed at that game and did something stupid this weekend? It would be sad. These guys just need to focus on the games at hand. Nothing more.